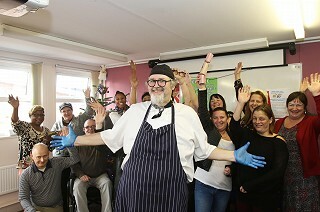 On Monday 10th December 20 GEM Project participants came together for a fantastic Christmas lunch, cooked by a previous GEM participant Andy Kirk, who is now employed part-time as a café manager chef at Priors Park Neighbourhood Project, and has been instrumental in setting up the Community Café there. Participants from around Gloucestershire joined the celebration held at Priors Park giving them a chance to meet, share their progression and achievements so far on their GEM journey whilst enjoying a delicious lunch two course Christmas lunch cooked by Andy. Navigator Developer Julie from GRCC said: "I have been so inspired by Andy’s journey on the GEM project that I wanted to arrange this lunch to show case his talent and his progression through GEM. When I met Andy back in April at the start of his GEM journey he had been unemployed for 8 years to due ill health and anxiety. Initially several of our meetings had to be rearranged because he had suffered panic attacks. I suggested he attend the ‘Feel Good Courses’ being run at Priors Park, where his knowledge and experience on helping members of the Tewkesbury Allotment scheme led to him advising Priors Park on what to make with their surplus of vegetables that they grew. From there, he then did a cooking demonstration, helped them to set up the Community Café and went on to be employed by PPNP as a Café Manager Chef for the community café. The Christmas lunch I felt was an apt celebration of how his journey has become complete, whilst also providing inspiration to the participants and showing that with the support of GEM and their Navigator Developers they too can have a successful outcome like Andy."